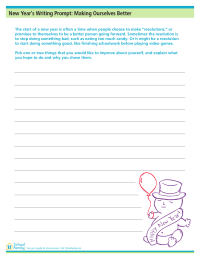 Printable New Year's theme coloring pages for holiday fun! 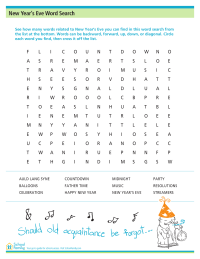 Children will see how many words related to New Year’s Eve they can find in this New Year's Eve-theme word search. Words can be backward, forward, up, down, or diagonal. 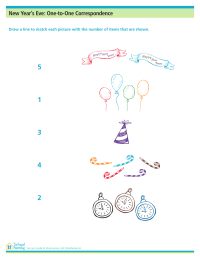 New Year's-theme worksheet will encourage critical thinking skills for young children, who match each picture with the number of items shown. Fun and easy to write, an acrostic is formed when the first letter in each line spells out a message, reading top to bottom. 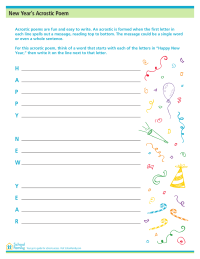 On this acrostic, kids will think of a word that starts with each of the letters in “Happy New Year." 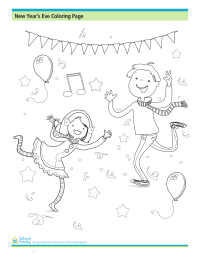 New Year's Eve party coloring page with balloons and streamers and kids dancing to music.